The Developer tab is home to some very useful commands in Microsoft Word 2010. However, by default this tab is not displayed in the ribbon, and you will need to tell Word that you want to see it. If you know how to switch on display of the Developer tab in Word 2007, you …... The Developer tab in Microsoft Word and Microsoft Excel provides access to several advanced features, like form controls, macros, and add-ins. Microsoft hides the Developer tab by default. Unable to find the option to enable the Developer Tab in Word 2010 This thread is locked. You can follow the question or vote as helpful, but you cannot reply to this thread.... It turns out that the only way to get the Field List to display in the Word Developer tab is to install this additional product, Dynamics GP Add-in for Microsoft Word. The Setup.exe is on the Microsoft Dynamics GP install DVD. If you haven't used the 'Developer' tab before, you'll have to add this. To do this, go to 'Options' under the 'File' tab. 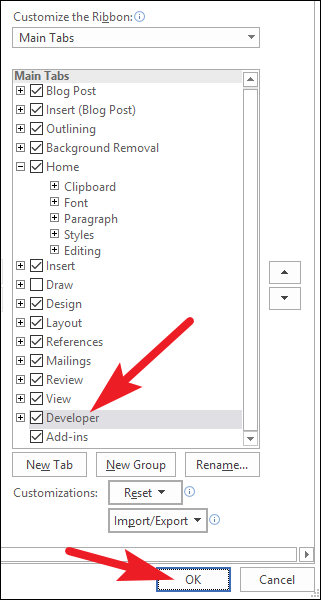 Under the 'Customise Ribbon' section, you need to tick the box next to Developer on the right side. You should now see an extra tab in the ribbon. Once you click this, you will be using the how to add an org chart in powerpoint Answer: To display the Developer tab, click on the Microsoft Office button in the top left of the Excel window and then click on the Excel Options button. When the Excel Options window appears, click on the Popular option on the left. It turns out that the only way to get the Field List to display in the Word Developer tab is to install this additional product, Dynamics GP Add-in for Microsoft Word. The Setup.exe is on the Microsoft Dynamics GP install DVD. 30/10/2013 · Unable to find the option to enable the Developer Tab in Word 2010 This thread is locked. You can follow the question or vote as helpful, but you cannot reply to this thread. The tools that you will need to add form controls to your template can be found in the Developer tab which is hidden by default. To show the Developer tab, click "File". Then click "Options".